Ayat with one of her two sons. Photo by Michel Tannous/Preemptive Love Coalition. That’s a mother’s heart. Ayat, a young mom of two, does what she can to protect her children from the realities of life in wartime Syria. But it’s often hard to pretend that everything is normal. She doesn’t own a washing machine to help clean her boys’ clothes. She doesn’t own a television to help keep them distracted on the hard days. There is a refrigerator in her home at least, though she doesn’t own it, and knows it could be repossessed any time. Ayat and her husband used to have some money to live on. Her husband is a soldier, and chose to enlist so he wouldn’t be forced to leave his village to serve far away from his family. But he’s not getting a salary anymore. He’s working as a volunteer—still gone from his family the same number of hours each day, still risking his life, only now that sacrifice doesn’t help to feed his family. Ayat, enjoying the warmth of the sun on a cold winter day. Photo by Michel Tannous/Preemptive Love Coalition. “I like crocheting. I’ve done it since I was 10. My sister Zourouf taught me…” It’s Ayat and her skills with a crochet hook that are feeding her family now. It’s been a terribly cold winter in Syria, bringing with it a lot of suffering and even death for fifteen children. You are stepping in with waterproof boots, warm sleeping bags and mats to make the winter, and the process of remaking home, a little warmer. And you provided Ayat a role in making that happen. Fatima sits with her youngest son Mohamed. Photo by Michel Tannous/Preemptive Love Coalition. “We live moderately” Fatima tell us. “I knit to help my husband and to purchase things for my daughters.” Fatima’s husband works hard at a job in the next village, but he doesn’t earn quite enough for the family. You provided a chance for Fatima to help. With all of our programming, we are strategic to get maximum benefit from every dollar you give. When it became clear that so many families were in need of cold-weather gear to keep them warm, we could have made a bulk purchase and completed the task in a few hours. That would have benefitted the families in need, and a single supplier. We were determined to multiply the impact further. Instead, local women in need of work were commissioned to use their skills in crochet to make warm, handmade hats and scarves, with yarn purchased from local suppliers. Now, Syrian families trying to rebuild their lives are getting the warm clothes they need. Purchasing the yarn from local suppliers supports the local economy—essential in an economy devastated by war. And purchasing finished crochet goods from local makers in need, like Fatima, provides essential income for even more families. Fatima stays inspired by her daughters. Photo by Michel Tannous/Preemptive Love Coalition. Reem crochets with her youngest son Mohamad by her side. Photo by Michel Tannous/Preemptive Love Coalition. Reem learned to crochet recently, in order make some income for her family. “I can make around five hats a day, depending on how much housework I have.” Crocheting hats and scarves is providing essential income, but it’s also helping her son recover from trauma. “I bring him to the [crochet group] to play with the children, and I try to help him get stronger and more confident.” This crochet collective provides companionship for Reem, and a sense of safety for her oldest son. Reem’s hats are of great use to the families receiving them—Fatima’s and Ayat’s crocheted goods too. 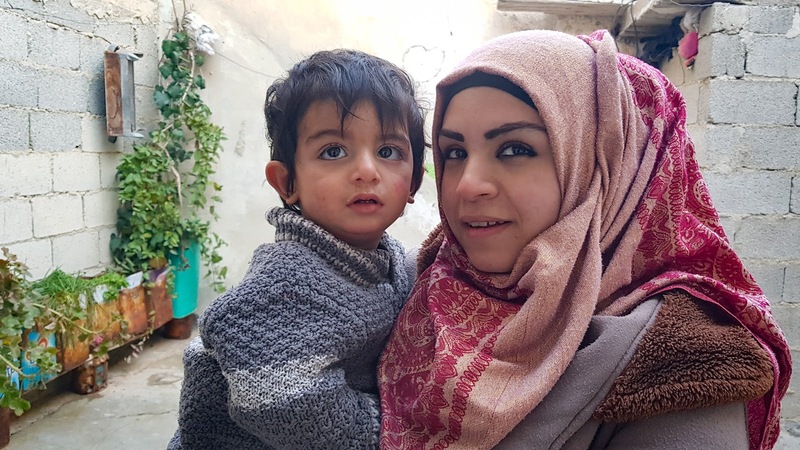 Warm clothes for Syrians who need them, income for women with skills in crochet, companionship during a time when life is especially hard, safety and security for a little boy traumatized by war—all coming from some crochet hooks and your donations. Help keep Syrians warm through the winter. Donate now.